I believe in choosing the right tool for the job, using React for a portfolio might seem like an overkill but I decided on it mostly because I want to get better at it. For that same reason I chose AWS to deploy it instead of Github or Netlifly. AWS is a beast and I want to learn as much as I can. When coding the app I learned a few new tricks that I believe are worth sharing. On LanguageContext.js is where the text translations live and the Context is created and exported. The App component is the most outer component, where the toggleLanguage function is actually implemented. LanguageContext.Provider component wraps every other children that needs to consume the "global" state. Watch out when sharing functions that access state, such functions need be explicitly binded to state, by either using the super(props) keyword or the bind(this) method, otherwise components nested deep down executing this function will throw an error. The LanguagePicker component is nested about 3 levels deep, thanks to the LanguageContext.Consumer component, this is how state can be accessed. This could have been achieved with Redux too, but I didn't need it for anything else. The Context API shouldn't be used lightly though, so keep that in mind. It's very useful if a behavior needs to be triggered when some element is visible inside the viewport. I used it to trigger some animations, but the most meaningful use case has to do with improving the site's load time, first contentful paint and lower bandwidth usage. The <img> tag renders right away whatever's in its source, even if the component hasn't mounted yet, so the user will download images that might never even get to see. A slow down in the first contentful paint is also expected. https://res.cloudinary.com/georginagrey/image/upload/c_scale,h_12,w_12/v1532709273/portfolio/portfolio.jpg, if you take that bit off, you get the original image. Heads up: The IntersectionObserver it's is not entirely supported across all browsers, so you might want to use a pollyfill or a fallback. This is my weakest spot, it wasn't until recently that I kinda got my head around CSS3, or that's what I thought until I started to fall in every "gotcha" possible when styling components using just plain CSS. I had to re-write the whole thing a couple of times, until I decided to use emotion, even though css-in-js causes some outrage, I decided to give it a go and I loved it, I no longer have to worry about overriding rules while working on different components. The layout is quite simple, I went with a mobile-first approach, and got away with using flexbox only. In a nutshell, this is a React static website hosted on a S3 bucket served by CloudFront and Route53. How did I end up with that?! After writing the main React components and styling most of them, I stumbled with Google's Lighthouse auditing tool, I downloaded the Chrome extension and generated a report (locally) and within seconds I got the results and a list of opportunities for optimization, for example, by enabling "text compression" in the server, the app should load about 3 seconds faster in my case. I didn't know what that meant, so after googling for a bit I came across Cloudfront, to top it off you can request a SSL certificate for free. Setting everything up is not as difficult as it may sound, here is a very handy guide. What will you get? Hosting, increased performance, faster delivery and secure HTTPs. S3 and CloudFront are not per se free, is pay-as-you-go service, so for a low traffic website we would be talking about paying cents per month if anything at all, after the 1 year free tier expires. Route53 is the DNS provider, there's a fixed price of $0.51/month per hosted zone, so we're talking only about $6/year. In this I case I already had a domain registered in Godaddy, to make it work I just grabbed the DNS names Route53 provided me with and saved them inside the Manage Name Servers form in Godaddy. As is expected, every time a request comes into CloudFront it will serve whatever is cached instead of going every time to your S3 bucket looking for the files, how long the content stays cached, depends on the default TTL timeframe configured, read more about it here. 3600 seconds (1 hour), I also added a header cache-control:max-age=0, to the meta-data of the origin S3 bucket. But soon I'll be reverting that and use Invalidation instead, it force flushes the cache without needing to wait for it to expire. Doing it this way is actually cheaper too. CloudFront served +2300 requests for America/Europe tier. Plus DNS routing and storage for $0.62 total. It won't get more expensive than that since a surge in traffic is not expected. This isn't my first time dealing with AWS, but it's my first coding the front-end of a website, so any comments are greatly appreciated. Edit 07/30: Added warning about IntersectionObserver. Edit 08/03: Added AWS Billing Statement. Web developer crafting code from the tropics, based in Costa Rica. I work hard so my dog can have a better life. I also love traveling and eating delicious food! 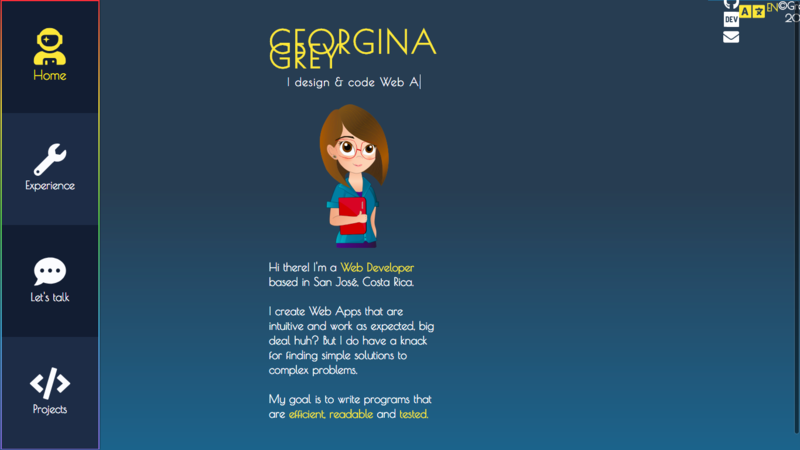 Hey Georgina, your portfolio looks beautiful. I love the layout. You're right, small details I tend to miss sometimes. Thanks for bringing it up! Hola! Qué bueno encontrar una tica por aquí! Me pasas los recursos que le mencionas a Chad de trabajo remoto (el email es mi usuario aquí + "cr" al final, at gmail)? Pequeño typo: "trabajando en bases de daños". Pura vida! Hola! Claro voy a buscarlos. Jaja a pesar de haber leído eso mil veces no sé cómo se me escapó, gracias. Al rato fue un mensaje del subconsciente 😂 saludos! On an unrelated note...I’d love to learn how you are monetizing your coding/development and living overseas. I’ve been considering it for some time, and I’m always interested in tapping someone’s brain on the subject. Any input is appreciated! Hi Chad. I'm actually from Costa Rica. But I do remote work nevertheless, so it doesn't matter where I do it from. Congratulations, nice to see people from my same country doing nice things!, it looks like you are going the right way and using the right tools (although I would have chosen Netlify). Now that you are diving into front end development I would recommend you to take a look at css grid (cssgridgarden.com/#es). Any react question you have, you are more than welcome to ping me at GitHub or Twitter. Hey, Just checked your portfolio. It looks nice. But seems like there's some issues with alignments. Wonderful website however on lower resolution than 1080p the text on the second menu item bugs out on my second monitor. Thank you! I'll check it out, thanks for the heads up. Hey congratulation on your first portofolio. It looks beautifull. Very cool. Thanks for sharing your knowledge and experience, especially the AWA bits! I knew I was forgetting something! Thanks for the reminder. Thank you. I'll be pushing the CDN Invalidation in a bit. However I'm on mobile(Chrome on an iPhone) and clicking on "experience" completely breaks the site to the point of having to refresh it. Oh! That ain't good. I'll see if I can reproduce it, thanks a lot! Great write up Georgina. If you are looking to expand on this to learn more AWS, check out my book or feel free to ping me with any questions. 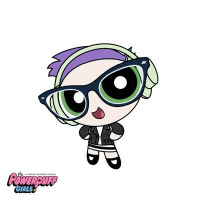 Thank you Kyle, this is great, AWS can still get a bit overwhelming at times. I'll look into it. Just one minor correction: it's TTL (time to live) rather than TLL. Of course! I fixed it, thanks! It looks really good! Great job! As someone who's just getting into frontend development I think your portfolio does a lot of things right and it's provided me with some inspiration. 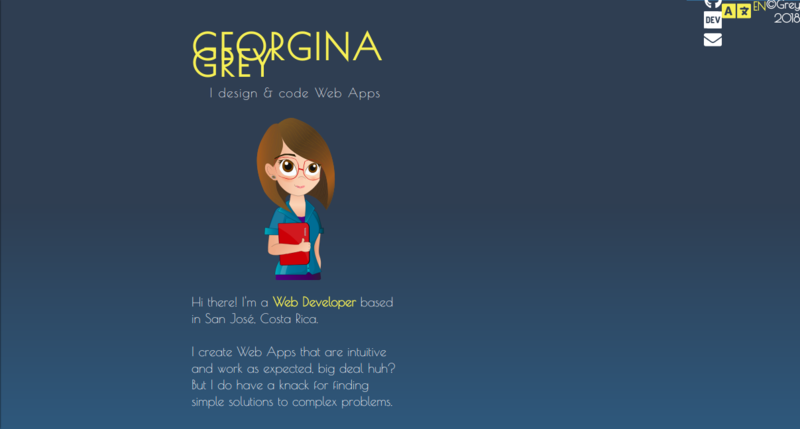 Hey Georgina, your site is beautiful and creative. thanks for your sharing your work. Se ve chiva la vara, pv! Demasiado Chiva te quedó ! Why you need AWS? Advertisment? AWS is a beast and I want to learn as much as I can.